Your customers depend on you to install a food service cooler that is affordable, reliable, and guaranteed. SRC Refrigeration has been designing and manufacturing custom food service refrigeration units for more than thirty years. Our custom walk-in coolers are made in Michigan using American parts. We pack and ship to your location near Houston TX in one shipment, making it easy for you to install the unit and get it up and running. 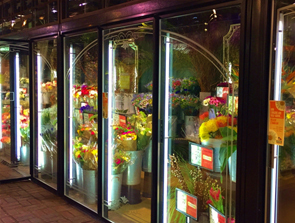 SRC Refrigeration designs and builds the highest quality beer caves, restaurant coolers, food service coolers, floral coolers, funeral coolers, combo units, and industrial coolers of all shapes and sizes. We are the preferred choice for contractors and re-sellers. Our access to a wide array of medium-temperature and low-temperature systems allows us to design the right refrigeration system for every indoor and outdoor application. I look forward to receiving the new unit from SRC. We are very happy with the improved design over our other cooler we purchased quite a while ago, especially the new door design that SRC has come up with. Thank You!